The Society for Conservative Thought hosted a panel and discussion last Wednesday surrounding issues of campus free speech and expression, titled “Considering the Case for Campus Free Expression.” Sponsored by the political science department and the Class of 1971 Public Affairs Forum, the panel consisted of Associate Professor of Biology Luana Maroja, Professor of Philosophy Steven Gerrard and Communications Director of the Foundation for Individual Rights in Education (FIRE) Nico Perrino. When the panel fielded questions from the audience, some students provided strong pushback to the panelists’ commentary. The College’s administration has recently been grappling with how to adjudicate issues of free speech and expression. Following a faculty petition on the Chicago Principles and a counter-petition by students and other faculty, President of the College Maud Mandel announced the formation of the ad hoc committee on inquiry and inclusion, tasked with recommending guidelines for speaker invitation. The committee is expected to release its recommendations in May. In mid-February, issues of free speech on campus resurfaced following Associate Professor of Philosophy Keith McPartland’s deconstruction of a student memorial for Kimberly Love, assistant professor of English, and Kai Green ’07, assistant professor of women’s, gender and sexuality studies, who are currently on leave from the College. 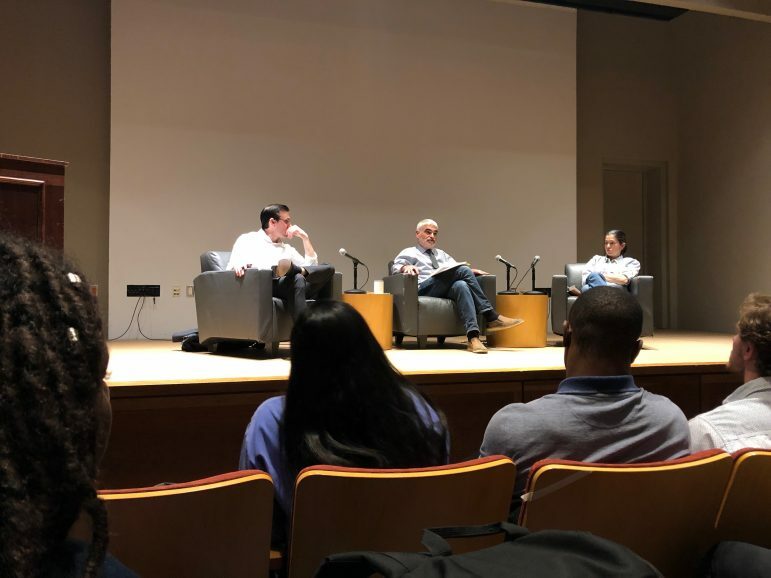 While McPartland cited fire code violations as the impetus for the removal, some students said that they felt that his actions were incongruent with his defense of the Chicago Principles. In the days immediately leading up to the event, John DiGravio ’21, the president of the Society for Conservative Thought, sent an email to invite signatories of the student-led counter-petition to the event. “I would like to inform you about an upcoming campus opportunity to listen, learn and voice your perspectives on this important subject,” the email read. Maroja cited Reza Aslan’s address during a free speech panel earlier in the year as the motivation behind her advocacy for the Chicago Principles. “This nonsense … was met with intense student applause,” Maroja said. The faculty petition advocating for the adoption of the Chicago Principles circulated following that panel. “We do not want free speech because we want to invite bigots but because we cannot have discussions stifled without hurting the cause we’re trying to protect,” she concluded. The second panelist to speak was Perrino, who began by identifying the changes that discourse surrounding free speech has undergone on campus, identifying the 2013 student protest against former New York police commissioner Ray Kelly at Brown as a turning point. “Students were our best advocates for free speech on campus … That’s when we started to see these trends you’re hearing about today percolate,” Perrino said regarding the demonstration against Kelly. “That’s when we started to see violence on campus.” The protests against Kelly resulted in his presentation ending early, though the student protest did not involve physical violence. Perrino later went on to reference 2017 as the peak year of violence on campuses, citing protests that had taken place at UC Berkeley that year that resulted in property damage and some injuries. Perrino believes that this violence can have the most direct impact on faculty. “There are [a] myriad of cases where faculty are subject of internet mobs that call for their firing,” he said. Perrino also cited threats to student press as a current threat to free speech, with examples like Loyola University Chicago’s policy of requiring that the campus newspaper seek interviews through the college’s communications department. After questions from Gerrard, the panel received audience questions, many of which were critical of the panelists’ positions. The first question was asked by Bilal Ansari, director of campus engagement and acting director of the Davis Center. Referencing the memorials erected to Love and Green, Ansari told the panel, “Sometimes, we have members of faculty or people who are in power who don’t follow those four steps and they end up shutting down the free speech of those who don’t have that power,” referring to the four basic steps of a nonviolent campaign written in Martin Luther King Jr.’s Letter from a Birmingham Jail. “How do you account for [the] capital that could be given to a marginalized identity, that could actually benefit people, and benefit a greater cause than somebody who is saying that Black people aren’t as intelligent?” Adna Mohamed ’22 asked, referencing the funds that would be used to bring a speaker to campus. Perrino sought to clarify the extent to which these speakers utilized college resources. “It is minuscule the amount of money that would be spent on someone like [John] Derbyshire,” said Jana Sawicki, chair of the philosophy department, who also chairs the ad hoc committee on inquiry and inclusion. Martin reiterated that, to him, it was about values, not money. Maroja took the question in a different direction, pondering the potential backlash that the College could receive as the result of a rigid speaker policy. “Once you decide on who is allowed to be invited, then you are effectively endorsing speakers, and I find that an extremely dangerous place to be,” Maroja said. The discussion shifted toward the decision by McPartland to dismantle the memorial in Hollander. “Whose free speech do you believe in?” Olaose asked the panel, highlighting both McPartland’s free speech advocacy and his removal of the memorial. Maroja responded to the question, stating that “he was acting as the building committee chair,” and told the audience that McPartland was in contact with the fire marshal and security. The Record has not been able to verify the claim that McPartland contacted the fire marshal prior to his removal of the memorial. “There [is] a definition of free speech in which you are able to put [up] signs along as it doesn’t disturb things,” Maroja told the audience, “You are not able, under free speech, to stop traffic. You will actually go to jail if you stop traffic to protest something.” Maroja also cited the materials that were posted on McPartland’s door as symbolic of his dedication to freedom of expression. “It’s an unfortunate event,” Maroja said. Gerrard responded again, telling the audience that students would have gained an insight into a Trump immigration policy from John Derbyshire, a white nationalist whom then President of the College Adam Falk disinvited from speaking at the College in 2016 following student protests. Perrino concluded the event with a defense of speech on the grounds of precedent. “Upholding the process is important, and there is a concern about what would happen if you just create an ad hoc process where the whims of any one individual can decide what justice gets administered,” he said. Editor’s note: This article was updated at 3:46 p.m. on April 11 to correct the spelling of Nico Perrino’s name.